PR Web: Newly founded Optilux Inc. will expand the liquid lens actuator technology, pioneered by Varioptic S.A., and optimize it for the consumer mobile telephones and tablets market. Optilux got the exclusive global rights to bring Varioptic’s proven technology to smartphones and tablets. Optilux was formed by Hamid Farzaneh, a former Varioptic CEO. “We believe that Parrot's acquisition of Varioptic and the creation of Optilux--which is focusing solely on mobile telephones and tablets applications--ensures that the highly-advanced liquid lens technology will be adopted broadly across many different segments,” said Henri Seydoux, Chairman and Chief Executive Officer, Parrot S.A.
Customers currently using or evaluating Varioptic products for camera phones are not supposed to see a gap in support. Optilux’ agreement with Varioptic enables camera phone actuator customers to continue to receive support from Varioptic as needed. Optilux and Varioptic will continue to cooperate on further joint development of the core technology. Thanks to JW for sending me the link! PR Newswire: Pixelplus announced unaudited financial results for Q1 2011. Revenue for the quarter was 7.3 billion Korean won (US$6.7 million), compared to 7.5 billion Korean won (US$6.8 million) in the fourth quarter of fiscal 2010, and 4.1 billion Korean won (US$3.7 million) in the first quarter of fiscal 2010. Net income in the first quarter of fiscal 2011 was 1.0 billion Korean won (US$0.9 million), compared to a net income of 0.9 billion Korean won (US$0.8 million), in the fourth quarter of fiscal 2010, and a net income of 0.3 billion Korean won (US$0.3 million), in the first quarter of fiscal 2010. Gross margin for the first quarter of fiscal 2011 was 36.8%, compared to 34.7% in the fourth quarter of fiscal 2010. "The key to our consistent growth and success will be our ability to transform our organization to achieve long-term profitability. For this aim, I believe our strategic and ongoing cost-control measures should help us decrease our cash requirements, concentrate on our core business, maintain our continuity, and improve the efficiency of our operations," said Dr. S.K. Lee, CEO and Founder of Pixelplus. Japan-based THine announced it adopts Scalado’s SpeedTags for its 8MP and 13MP ISP lines for smartphones. Thine got into ISP business 2.5 years ago through acquisition of ISP business from Winbond. Scalado says that more than 600 million mobile phone handsets now feature its software, and Scalado lists all of the top five tier 1 mobile phone manufacturers and top 10 ISP/Sensor companies as its licensees. "The Program for the 2011 IISW has been posted on the www.imagesensors.org website. There are 3-1/2 days of image sensor technical papers to be presented (incl. a recess on Friday for a social outing). It is one of the most extensive IISW programs to date. Despite the problems in Japan, we now expect about 150 attendees, including a number of very happy waitlisted persons! The 2011 IISW will include presentation of the Walter Kosonocky Award and a new award, the Exceptional Service Award. Winners of these awards will be announced at the IISW." Digitimes: Connected TVs with built-in camera modules will become a trend, which camera used for Skype video calls, face recognition and motion detection, according to Digitimes sources in Taiwan. Japan-based vendors are expected to take the initiative to launch connected TVs with built-in camera modules by the end of 2012, the sources indicated. Such camera modules will have a H.264 codec to compress 720p/30fps video, according to the same sources. It looks like Refocus Imaging has changed its name to Lytro. The company claims to implement "in software what the conventional camera and lens must do physically in hardware [focusing, that is]. Using the power and economics of software, computational photography removes the physical constraints of camera and lens systems." 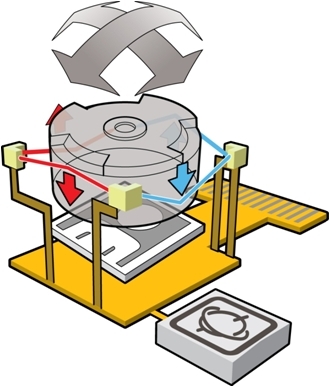 Mark Levoy's group from Stanford University seems to stay at the roots of this technology. PR Newswire: Omnivision reported revenues for last quarter to be $258.3M, as compared to $265.7M in the previous quarter, and $157.2M y year ago. GAAP net income in the last quarter was $34.0M, as compared to $44.7 million in the previous quarter, and $3.5M a year ago. Gross margin for the quarter was 30.7%, as compared to 29.8% for the previous quarter and 24.9% a year ago. The sequential increase in gross margin reflected the favorable impact of an increase in the proportion of sales of premium products within each product resolution category. Revenues for the fiscal year ended April 30, 2011 were $956.5M, as compared to $603.0M in fiscal 2010. GAAP net income for fiscal 2011 was $124.5M, as compared to net income for fiscal 2010 of $6.7M. Based on current trends, the company expects next quarter revenues will be in the range of $265M to $285M. Yahoo: While both profit and revenue came in ahead of analyst estimates and OmniVision issued a solid forecast for the current quarter, investors appeared disappointed that the outlook wasn't stronger. And then on the Kodak acquisition, very interesting but can you explain first what the near, medium and long term benefits are of acquiring that in terms of customer margins, defensibility, etcetera. And for that matter even pricing. Okay. Shaw had a comment on obviously you know if anything it’s, what, 800 or 900 degrees of additional freedom was to innovate and operate. That is definitely a near time benefit. Longer term that may translate into better designs, better products while comparative products, so to speak. Now whether or not we will do anything further with the portfolio for instance any plan to monetize it or not, it’s still early for us to discuss those things. Obviously in due time when we have formulated a plan we will discuss it on our calls. "Optical Performances of Lensless Sub-2micron Pixel for Application in Image Sensors"
Progress In Electromagnetics Research B, Vol. 31, 1-14, 2011. The paper proposes to use a gold film with sub-micron aperture holes on top of polymer-based lightguide instead of microlens. The simulation shows that light diffracted from the aperture, mediated by the generation of surface plasmon-polariton modes, is entirely confined within the lightpipe. Full 3D simulations on a Bayer cell composed of four pixels demonstrate that it is possible to improve optical efficiencies and crosstalk rejection between adjacent pixels by 30% and by a factor 12 respectively better than those ones obtained in similar pixels equipped with microlenses for pixel sizes close to 0.97um. In simulations the radius of the circular section at the bottom of the lightpipe, i.e., the photodiode area, was fixed at 0.4 um, the pixel size D varied from 1.75 to 0.97 um and the ILD thickness, L, was set to 2.5 um. The metal film thickness T is 0.2 um. "We have demonstrated that lensless pixels arranged in the Bayer cell configuration as used in commercial image sensor devices and making use of lightpipe structure have better optical performances respect to those ones obtained for pixels equipped with microlenses located at their entrance. By performing full 3D electromagnetic simulations of the light propagation inside the Bayer cell, we have shown that in terms of the normalized optical e±ciency and crosstalk, the lensless pixel geometry is always more efficient [with] respect to the microlens equipped counterpart. In particular, simulations demonstrate that the decrease of the normalized optical efficiency and the increase of the crosstalk effects as a function of the reduction of the pixel size is largely less effective for the lensless pixel geometry and this can foresee the real possibility to decrease the pixel size for values less than 1 um. Moreover, the proposed geometry is completely compatible with the actual large scale image sensor manufacturing process and overcomes the problems related to the fabrication of microlenses with large numerical apertures." PR Newswire: Hisense Group (Qingdao, China) has released its WDR security camera NVC2500 based on the turnkey WDR CMOS imaging solution provided by AltaSens and Apical. AltaSens and Apical started their strategic partnership more than a year ago. The partners have developed what they say to be the first 1080p60 HD WDR chipset in the imaging industry. The AltaSens CMOS image sensor utilizes "dual-exposure-in-a-single-frame WDR technology" to enhance its DR. In a first public PR released two months ago Altera was named as a partner too, not clear what is its status now. The today's PR only says that the solution is based on FPGA without naming a vendor. The NVC2500 camera supports H.264 BP/MP/HP and MJPEG compression formats and can transmit video by multicast and unicast in variant network conditions. Toshiba also made a video of the presentation available on-line up to Nov. 2011. EON: Berkeley Design Automation announced that Forza Silicon, a fabless semiconductor company specializing in high-resolution, high-speed CMOS image sensors, has selected the company’s Analog FastSPICE Platform for full-circuit verification and block-level characterization. "The CMOS image sensors we design have tremendous verification challenges," said Daniel Van Blerkom, Ph.D., CTO at Forza Silicon. "We selected AFS because it can handle verification of our CMOS image sensor ICs with nanometer SPICE accuracy on circuit complexities which were impossible in our current verification flow. At the block-level, AFS delivered identical results to traditional SPICE 20x faster in post-layout characterization." PR Newswire: SMIC announced that it has earned the "2010 Excellent Supplier Award" from its customer GalaxyCore. SMIC has earned the GalaxyCore Excellent Supplier Award for two consecutive years since the award was established in 2009. "GalaxyCore holds the largest CIS VGA market share in China, so earning this Excellent Supplier Award for two consecutive years is a great honor for SMIC," said SMIC President and CEO David N.K. Wang. "We will continue to improve our service and speed up the R&D on TSV / CU BEOL technology to assist GalaxyCore in the high-end product segment and pursue our mutual vision of products 'Designed in China, Made in China.'" "GalaxyCore has always insisted on being customer-oriented and our explosive growth over just a few years has made GalaxyCore a globally-recognized brand. We look forward to forging a closer relationship with SMIC on our future high-end products," said Stanly Zhao, CEO of GalaxyCore. I wonder what happened with Galaxycore's plans to transfer part of its production to HH NEC? It came to my attention that the official Sony Corp. history has a full chapter devoted to the history of CCD development. The chapter mainly talks about 70s and 80s works. At productization of its first 120Kpixel CCDs in 1979 the company's accumulated investment has reached 20 billion yen. primesense presentation @ kinect meetup from liubo on Vimeo. The article is written by Charles Hanson, L-3 Electro-Optical Systems (L-3 EOS) CTO for infrared products. Euronext: Parrot, mostly known as a maker of bluetooth hands-free accessories for mobile phones, finalized the acquisition of a 100% stake in Varioptic SA. Varioptic employs 19 people and recorded 0.6 million euros in revenues in 2010. The technical and operational synergies resulting from the business combination between the two companies are expected to enable Varioptic's operations to break even in 2013. This acquisition is financed with 0.6 million euros in cash, Varioptic has 2.6 million euros in net financial debt. In addition, there is a potential earn-out of up to 3 million euros linked to Varioptic's revenues for FY 2014. At the same time, Parrot is subscribing to a 4 million euro capital increase benefiting Varioptic. The PR has few statements on Varioptic's future: "The combination of Parrot's signal processing expertise and Varioptic's work on image processing research marks a further step forward with the development of the value chain, on both its existing products and new applications. Over the short term, further advances will support the solutions and products based on the Parrot AR.Drone [a toy quadricopter remotely controlled by iPhone via Wi-Fi]. Subsequently, the roadmap will be extended to include automotive product ranges, as well as home products." I've missed this news from Oct 1st, 2010: Reuters reports that SiliconFile has appointed Lee Do Yeong as its new Chief Executive Officer, effective October 1, 2010, replacing Shin Baek Gyu. Being slowly integrated into Hynix, Siliconfile and its new CEO seem to retain some degree of independency. At least, the company's stock is still traded at KOSDAQ under 082930.KQ sticker, albeit with quite low volume. Albert Theuwissen published remarks on his second edition of "Hands-On Evaluation of Image Sensors" course in Copenhagen, Denmark. The course includes a number of improvements and refinements. The next revision is scheduled to be delivered in November 2011 in Dresden, Germany. PR Newswire: Omnivision introduces the OV5690, the 1/4-inch 5MP sensor based on 1.4um OmniBSI-2 pixel. This the the second OmniBSI-2 sensor, while the first one was announced in February. The new sensor is targeted to slimmer tablets and smart phones. The OV5690 delivers 1080p HD video at 30fps, has an integrated scaler, and 2 x 2 binning functionality with re-sampling filter. The scaler enables electronic image stabilization, while maintaining full field of view in 720p and 1080p HD video modes, and allows for HD video with digital video zoom functionality. The OV5690's post-binning re-sampling filter minimizes spatial artifacts and removes image artifacts around edges, producing clean, crisp color images for 720p/60 HD video in binning mode. The sensor features a standard 2-lane (1 Gbps/lane) MIPI/LVDS interface, and fits into the industry standard 8.5 x 8.5 mm module size with a z-height below 5 mm, or approximately 20% lower than 1/3.2-inch 5MP image sensors. The OV5690 is being sampled by key customers and mass production is expected to begin in the second half of 2011. 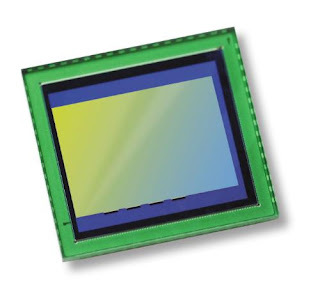 "With industry sources placing 5-megapixel CMOS image sensors at more than 15 percent of the overall sensor market today, we view 5-megapixel sensors as occupying as a sweet spot in the market," said Per Rosdahl, product marketing manager at OmniVision. "Some industry analysts believe that market share may exceed 30 percent by 2014 driven by the demand for higher performance resolution and increasingly slim mobile handsets, smart phone and tablet designs" (Source: TSR "CCD/CMOS Area Image Sensor Market Analysis" Dec, 2010). Talking about the future trends Sony says that as acceptance of HD video in security continues and CMOS video quality improves, the market is shifting toward CMOS sensors. It's nice to see this statement coming from the world's security CCD king. The Al2O3 film contains a stable density of negative fixed charges. Typically, this density is in the region of 9E12/cm2. This creates an accumulation layer in the p-type substrate of the image sensor. This accumulation layer can effectively passivate the surface. It ensures that no photoelectric charges are trapped near the back surface and that thermally generated charges recombine. This reduces the dark current in backside illuminated image sensors. Other possible materials for the passivation layer include: Aluminiumfluoride (AlF3); Aluminiumoxynitride (AlON); Zirconiumoxide (ZrO2) under certain conditions; Calciumfluoride (CaF2). 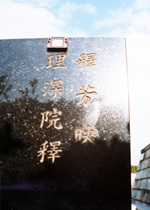 The Al2O3 film can serve as AR coating as well. "Less than five years ago, CMOS image sensors were one of the fastest growing segments in semiconductors, but since the middle of the last decade, this optoelectronics category has struggled with price erosion resulting from increasing competition by suppliers, slowing growth rates in camera-phone applications, and the last recession. After dropping 16% in 2009, CMOS image sensor sales rebounded by just 17% in 2010 to $4.5 billion compared to the semiconductor industry’s much stronger growth of 32% last year. Beginning in 2011, however, CMOS image sensor sales are expected to gain new momentum and consistency in growth from new systems applications beyond camera phones and stand-alone digital still cameras." 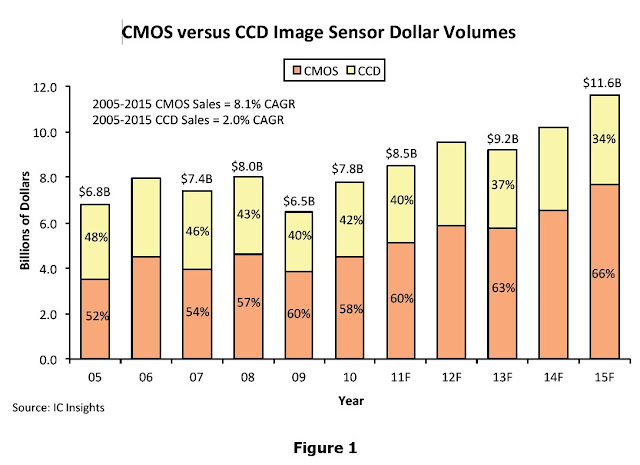 "CMOS imager sensor sales growing 13% in 2011 to a new record high of $5.1 billion, topping the previous peak of $4.6 billion set in 2008. CMOS image sensor revenues are forecast to increase at CAGR of 11.2% in the next five years, reaching $7.6 billion in 2015. CMOS imaging devices are expected to account for 66% of the total image sensor market in 2015, compared to about 58% in 2010. 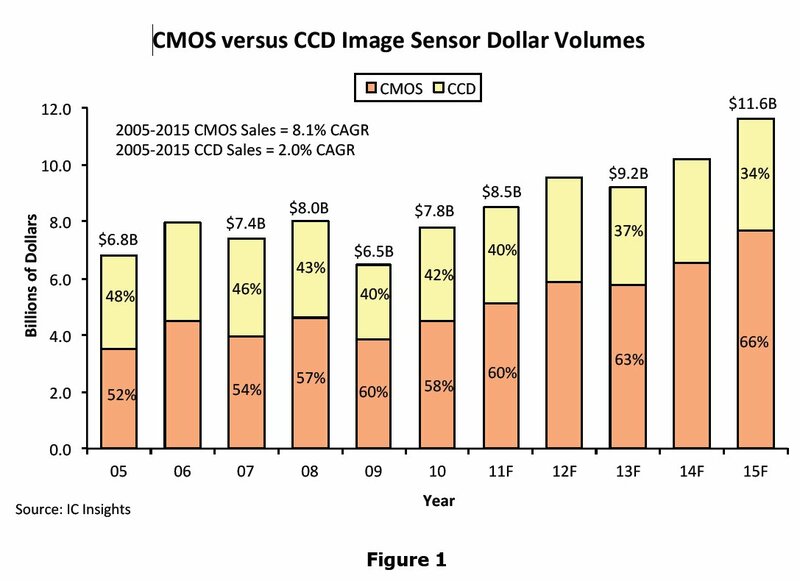 CCDs, which still dominate consumer digital camera applications, video camcorders, scanners, and copiers, account for most of the remaining sales—42% in 2010 and a projected 34% in 2015 (Figure 1):"
"Between 2003 and 2008, CMOS image sensor dollar volumes increased at a CAGR of about 27%, with unit volume shipments climbing by an annual average of 42%, but those rates of growth slowed significantly in the 2005-2010 period (5.1% for sales and 14.4% for units)." "IC Insights’ forecast of 11.2% CAGR for sales in the 2010-2015 period is predicated on strong new growth in automotive safety systems, intelligent video cameras for surveillance networks, medical imaging, toys and games, and other emerging applications. Camera phones accounted for 62% of CMOS image sensor sales in 2010 and are forecast to drop to about 49% in 2015." Business Wire: Henry R. Nothhaft resigned as Tessera's CEO and president to pursue his advocacy of smart innovation policies in Washington, as presented in his recently-released book Great Again – Revitalizing America’s Entrepreneurial Leadership (Harvard Business Press). The company’s Board of Directors appointed Robert A. Young, Ph.D., as its new president and CEO. Young has served as a member of Tessera’s board of directors since its inception in 1991. He has had a broad career including 17 years at IBM Corporation, where he held various executive positions. Subsequently, Young served as the managing partner of Dillon, Read & Co., Inc.’s venture capital operation before serving as Dillon, Read & Co.’s head of Technology Banking. He has a Ph.D. in physical chemistry from the Massachusetts Institute of Technology and a B.S. with honors in chemistry from the University of Delaware. "This is a very exciting time in the company’s history, given the opportunities we see to maximize long-term shareholder value," said Young. "The investments made in the last several years have positioned us well to take advantage of two rapidly growing and changing markets: consumer optics and intellectual property. The board has initiated efforts to re-structure the businesses to take full advantage of these emerging opportunities." PS: In case you are wondering what has happened with yesterday's Panasonic post, there is a major crash in Blogger database. The posting was disabled for some time and some posts are being recovered from backups now. I hope the Panasonic post will be back soon. 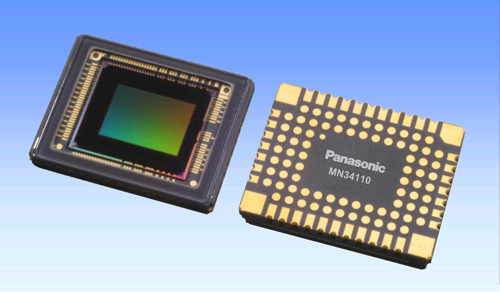 Panasonic announced it has developed 1/2.33-inch 14MP MOS sensor with industry highest sensitivity of 3050 e-/lx/sec/μm2. The new MN34110 is manufactured in 32nm/45nm combined process and features a "new light-focusing structure [which] significantly expands the incident light angle, ensuring uniform and high picture quality, as well as produces a slimmer camera". Based on the announced sensor's diagonal of 7.7mm and resolution of 14MP, its pixel size appears to be of order of 1.4um. However, no word of BSI appears anywhere in the PR. Instead it's said that "the simple manufacturing process is based on the current MOS image sensor structure, ensuring a stable supply" and "image sensor mass-production technologies allow stable production of MOS image sensors with high picture-quality". Panasonic will start mass production of a new sensor for digital cameras in December 2011 and says that it "continues to develop various types" (of sensors based on the same pixel technology, probably). Update: The sensor's preliminary datasheet is available on-line. The thesis goes into many details of designing ToF camera, choosing its right components and acessing the performance. Overall, it looks like step by step camera design guide. Traders Huddle: When reporting Q1 2011 results Himax CEO Jordan Wu said: "We are also excited about CMOS image sensors where we are seeing a surge in demand. Our customer base for CMOS image sensor is mostly leading brand names for both handsets and laptops. We continue to receive positive feedback regarding product performance and win new projects from these customers. On the wafer-level optics product line we just began our first mass production shipment and look for demand to pickup in the second quarter and onward." "Among our non-driver product lines, CMOS image sensors demonstrated the strongest growth in Q1, with revenues surging to a level which is multiples higher than the previous quarter. While foundry capacity remains a bottleneck, as we pointed out in the last earnings call, we believe the strong growth momentum of our CMOS image sensors will continue in the coming quarters. The gross margin of this segment was below our overall level in both Q1 and Q2, but we have seen steady improvement by replacing older generation products with newer ones and by bringing up the production yields of those newer generation products. Our customer base is mostly leading brand names for both handsets and laptops. We continue to receive positive feedback regarding product performance and win new projects from these customers. We are excited about the prospects of this product line and we’re fully committed to its long term sales growth and margin improvement. We mentioned in the previous calls regarding our wafer-level optics product line, where we are one of the pioneers in the world. We started our first mass production shipment to a leading handset brand earlier in the second quarter. We are going through the ramp up learning curve right now. Similar to the newer generation sensors mentioned earlier, the yield rates are being steadily improved. We are looking into expanding our in-house facilities for this product line because we do foresee a rapid demand pick-up in Q2 and onward. Further details will be provided in the next few quarters." Business Wire: Beijing EEDOO Technology, a future Xbox competitor in China; SoftKinetic, ToF hardware and software developer, and Namuga, an ODM specializing in video and 3D cameras, announced that EEDOO has selected the SoftKinetic DepthSense 3D camera to enable gesture-based entertainment on EEDOO’s iSec platform. Aimed at 120 million homes, the iSec is to bring 3D gesture-based multimedia and gaming entertainment content to Chinese families. The platform is the result of two years of development started from the S&P business unit in Lenovo. "We have been working very closely with the SoftKinetic and Namuga teams for over a year now, and feel that we have developed a competitive solution to offer to our customers the most exciting gesture-based entertainment experience," said Jack Luo, CEO of EEDOO. The iSec platform will be launched in China in the second half of 2011. Update: Forbes published few more details about Eedoo camera system in its interview with Omek Interactive, gesture recognition middleware provider. Eedoo "is built from the ground up as a motion gaming device with gesture and tracking interfaces. The camera range is optimized for the size of Chinese living rooms, which are generally smaller than Western living rooms." 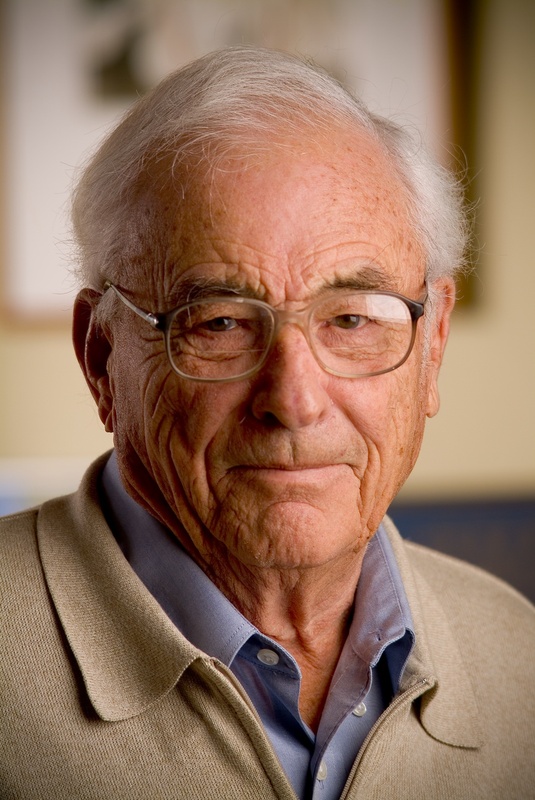 CBS: Willard Boyle, a Nobel laureate for CCD invention, died Saturday, May 7 at the age of 86. "They don't tell you until the last minute, and it's the biggest surprise of your life to wake up and somebody says you've won a Nobel Prize," Boyle told CBC News at the time of his win. In 1953 Boyle joined Bell Labs where he invented the first continuously operating ruby laser with Don Nelson in 1962, and was named on the first patent for a semiconductor injection laser. In 1969, Boyle and George E. Smith invented the CCD, for which they have jointly received the Franklin Institute's Stuart Ballantine Medal in 1973, the 1974 IEEE Morris N. Liebmann Memorial Award, the 2006 Charles Stark Draper Prize, and the 2009 Nobel Prize in Physics. Boyle was Executive Director of Research for Bell Labs from 1975 until his retirement in 1979. In retirement, he settled in Wallace, Nova Scotia, Canada. Thanks to RC for sending me the link! Update: LA Times piblished a big obituary revisiting the whole CCD invention story. Albert Theuwissen continues to discuss various non-linear effects and PTC measurements. The recent post shows how to extract conversion factor from the non-linear data. Aptina announced the opening of a new enginnering center in Hsinchu, Taiwan. The center will concentrate the company's regional engineering efforts and employ a broad range of engineering functions. "We look forward to identifying Taiwan engineering talent to bring on board to bolster Aptina's local engineering, R&D and innovation efforts," said Jeff Mendiola, Aptina's VP of Operations. "Aptina's new center will increase engineering efforts in advanced packaging, test, product engineering, quality assurance and operations, among others to meet the specific needs of our customers and partners across the Asia Pacific region," said Sammy Yi, Aptina's VP of Assembly Operations and Advanced Packaging. "The addition of this new office will promote a stronger and more agile supply chain, enabling us to respond to our customers and partners faster." PR Newswire: MIPI Alliance and the USB 3.0 Group will facilitate the combined use of the MIPI M-PHY(SM) physical layer with the SuperSpeed USB protocol and software layers to produce the SuperSpeed Inter-Chip (SSIC) specification. Currently under development, the spec will bring M-PHY's high bandwidth and low power, and the performance enhancements of SuperSpeed USB "inside" the mobile device interface system. The two groups anticipate the SSIC specification will be available to USB adopters in early 2012. Essentially it brings the unification between PC and mobile worlds, allowing same MIPI-interfaced sensors be used for both. So far M-PHY interface works up to 2.9 Gbps per lane with up-scalability to 5.8 Gbps per lane, while SuperSpeed USB has a 5 Gbps signaling rate. Update: EETimes published an article on MIPI-USB marriage. 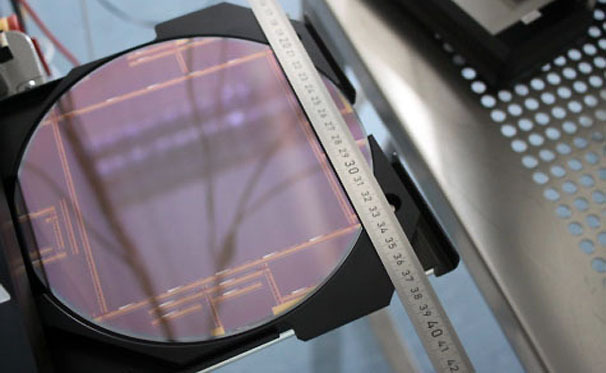 PC World: University of Lincoln (UK) announced it has created the 12.8cm by 12.8cm square imager claimed to be the biggest ever made on 200mm wafer. Nigel Allinson, Distinguished Professor of Image Engineering at Lincoln created "DynAMITe" sensor, said: "DynAMITe was designed for medical imaging, in particular mammography and radiotherapy, so the individual pixels are much larger than those found in consumer digital cameras or mobile phones. As it will withstand exposure to very high levels of x-ray and other radiation, it will operate for many years in the adverse environment of cancer diagnosis and treatment instruments; and represents a major advance over the existing technology of amorphous Silicon panels." Business Wire: Aptina announced that its APS-C format 16MP MT9H004 sensor was selected as a winner in the 2010 EDN Innovation Award competition for its ability to deliver maximum SNR across all scene lighting and ISO speed conditions. Through the addition of a pixel-level, dual-conversion gain switch, MT9H004 combines two modes of operation in one pixel design – a high conversion gain mode with increased sensitivity and low read noise for low-light scenes and a low conversion gain mode for large charge handling capacity in bright scenes. The prototype camera modules are said to provide more than 24dB (more than 4 optical stops) of hand shake suppression for 8.5-mm by 8.5-mm by 5.7-mm 8MP module. The motor is controlled by XC104 SMA Motor Processor IC developed in collaboration with Swindon Silicon Systems. The chip is based on 8051 core that controls integrated MOSFETs that deliver up to 30-mA to heat and control the SMA wire. The chip is being manufactured by IBM at Burlington in a 0.18um process. The company's business model is to license lens and camera module integrators to use its SMA actuator patent portfolio and provide the control ASIC, its CEO Simon Calder Calder said. 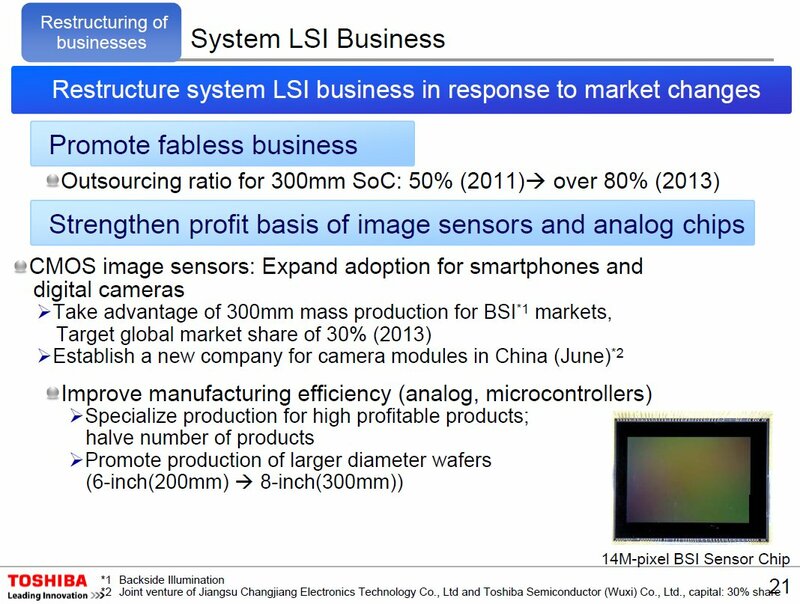 Cambridge Mechatronics is targeting mass production of 8- and 13-MP OIS-plus-AF cameras in Q2 2012. Digitimes: Pixart expects its revenues to grow 10-15% sequentially in Q2 2011 due to strong demand for optical mouse sensors, but its gross margin to drop to 34-35% from 35.7% recorded in the previous quarter. The company's shipments of optical mouse sensors are expected to top 90-100M units in the first half of 2011 and 200M units for all of 2011. Shipments of high-margin sensors for Nintendo's Wii consoles are likely to decline in Q2 as consumers are waiting for the launch of Wii 2. 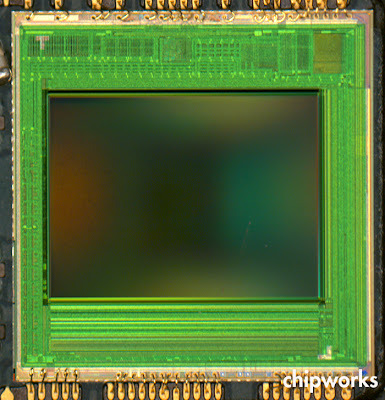 Chipworks teardown revealed that RIM Playbook tablet relies on two ST image sensors: 5MP primary camera's 5953BA and 3MP secondary 58548A, both based on 1.4um pixels. 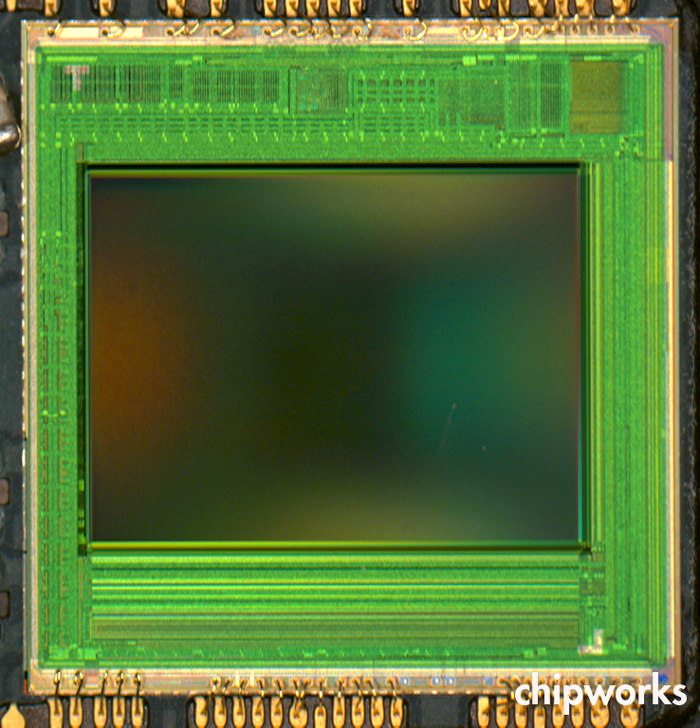 Chipworks writes: "This is a pretty big design win for STMicro, since it also has won the image processor (on a separate chip). The STV0986 (package markings show an X) is touted as a 5 Mp mobile imaging processor that can support up to two mobile sensors." The 5MP ST5953BA sensor is said to have "aluminum & copper interconnect, a unique implementation of Bayer patterned color filters, a novel unit pixel isolation technique, uncommon microlens structure, and a thinned pixel dielectric stack." Nobukazu Teranishi (Panasonic) has been selected as a recipient of the 2011 Photographic Society of America (PSA) Progress Medal Award for his invention of pinned photodiode. The award committee says: "The high performance of pinned photodiodes drove the pixel size shrinkage, and realized higher resolution. As a result, almost all CCD’s and CMOS sensors came to utilize the pinned photodiode, and 200-million CCD’s and 1,000-million CMOS sensors were produced for various applications in 2008. Mr. Teranishi’s pinned photodiode is the most innovative technology for both CCD’s and CMOS sensors." The award will be presented at the PSA International Conference of Photography in Colorado Springs, Colorado on Sept. 18-24 2011. Thanks to AT for sending me the news! Business Wire: TowerJazz and Medigus announced successful sampling of the second generation of TowerJazz's CMOS imager that serves in Medigus' line of disposable miniature cameras. Its image sensor measures 0.66x0.66 mm and has resolution of 45K pixels. Medigus and TowerJazz are said to use advanced technologies, including TSV for packaging. The camera’s diameter is only 0.99 mm which is said to be the first video camera in the world with a diameter smaller than 1 mm. Medigus will begin supplying samples of the camera to customers in Japan and in the US for cardiology procedures. The camera will be integrated in Medigus’ other endoscopy products and will also be sold to third-party medical equipment manufacturers. This paper proposes a digital correlate double sampling (CDS) scheme which is suitable for a column-inline time to digital converter (TDC). The column-parallel TDCs, where measurements are made with a counter and delay line interpolation, achieve high speed A/D conversion without decreasing resolution. An APS-C format image sensor with 12-bit 360 Mpixel/s readout is realized in a cost-effective 0.18-µm CMOS technology. A 3D image sensor is presented employing a time multiplexed concept for color and depth image acquisition in a single chip to generate a real-time 3D image of an arbitrary scene. The pixel adopts a split photodiode to demodulate time-of-flight signals effectively. Every four pixels share two storages and readout transistors to utilize 100% of photons and increase the sensitivity of infrared light by simple binning operation at the expense of resolution. With the fabricated prototype sensor, 640x480 color and depth images of the scenes 1-3m away are captured with an accuracy of 1-6cm. We present a new image sensor to help applications like high-dynamic range, structured illumination, motion corrected photography, etc. by providing two analog memories in each pixel. Clever pixel design allowed us to create the smallest pixel size and the largest fill factor for this class of imager, while supporting dual global shutter operation and true correlated double sampling (CDS) readout from both in-pixel memories to cancel kTC noise. A fully-integrated photodetector array for long-read length bioluminescence-based DNA sequence-by-synthesis is implemented. Each pixel has 120dB photocurrent detection dynamic range and includes a 10fA-10nA pulse frequency modulation (PFM) background subtraction block and a 1st-order Σ-Δ modulator. A novel CMOS image sensor including a pixel with a hybrid structure of an oxide semiconductor FET (OS-FET) and Si(SOI)-FETs has been developed. The OS-FET has an extremely low off-state current, and thus can form a highly insulating charge storage node in combination with SOI. We have therefore applied the OS-FET to an electronic global shutter CMOS image sensor and confirmed improvement in imaging quality. York University in Toronto, Canada published Wei Gao PhD dissertation "Low Power Design Methodologies in Analog Blocks of CMOS Image Sensors". The main approach is to use automated analog optimization to achieve the minimal current consumption at given constraints.